Whether staining new or rejuvenating old, new Resene Kwila Timber Stain is the product of choice for exterior timber decks and furniture. Kwila Timber Stain is recommended on Kwila, Cedar, exterior timber, and for restoration of badly weathered timber surfaces. New timber should be treated with Kwila Timber Stain before assembly, paying special attention to end grains and the underside of decks, as they will be difficult to coat after the deck has been assembled. 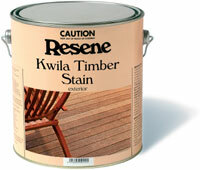 Resene Kwila Timber Stain may be applied by brush, spray or roller. As with other wood stains, the finish will typically require maintenance after two summers. Performance is related to the depth of colour applied, therefore light applications and dressed surfaces may require maintenance sooner, while heavier applications and rough sawn surfaces will require less maintenance. As with any coloured paint or stain, always trial Kwila Timber Stain on a representative piece of timber first to ensure it gives the desired result on the actual timber being coating. Stains are transparent, therefore the final finish colour will depend on the nature of the timber being stained. Stains applied to light woods will appear much stronger and brighter in colour than stains applied to dark wood. As with any coloured paint or stain, always trial Kwila Timber Stain on a representative piece of timber first to ensure it gives the desired result on the actual timber being coating. Resene Kwila Timber Stain is available from Resene ColorShops nationwide - or see Data Sheet D501 for more information on Kwila Timber Stain.